Day 4 we hit the road at 8:30 a.m. and by 9:30 we were smack in the middle of Santa Fe, the state capital of New Mexico. 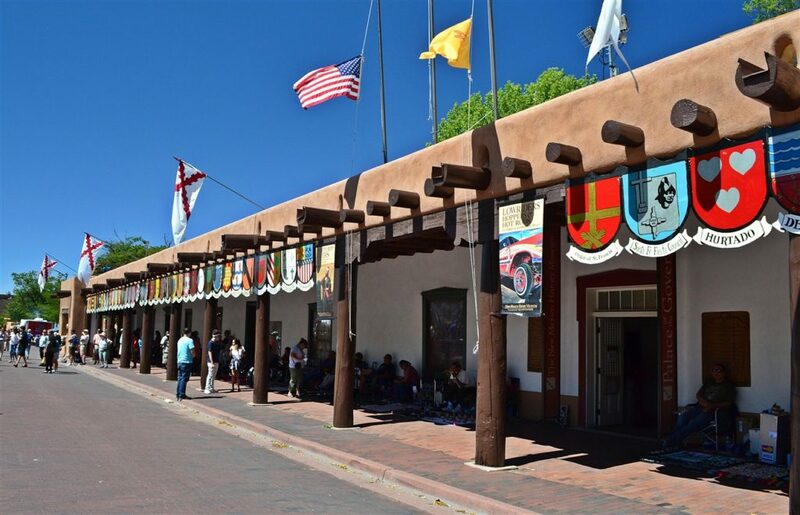 Santa Fe probably boasts as long, colorful, and fascinating a history as any city in the USA, and it’s a place you can’t fully appreciate without knowing at least a little of that history. 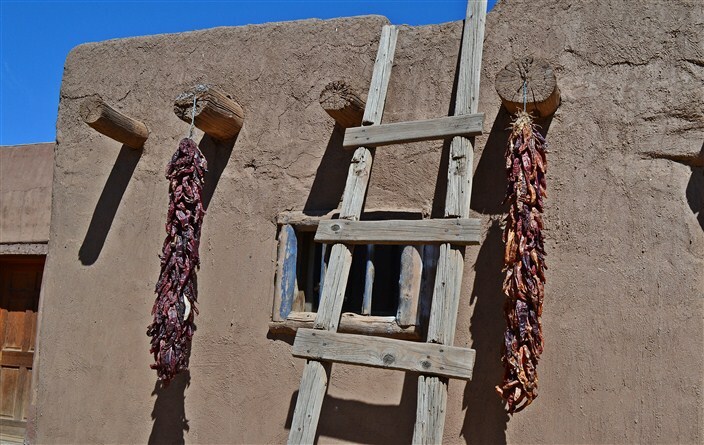 The city of Santa Fe was founded by Spanish colonists in 1610. It’s the oldest state capital city in the United States and the oldest city in New Mexico. It was a provincial capital under Spanish rule until the Mexicans gained their independence in 1810, when it then became the seat of the territory of Santa Fe de Nuevo México. Next came the Texans who had seceded from Mexico in 1836 and claimed Santa Fe and surrounding territory as part of western Texas along the Rio Grande. 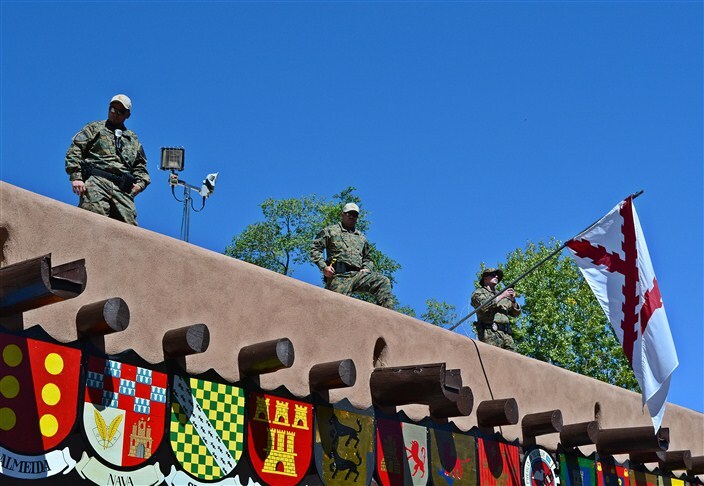 When in 1846, the United States declared war on Mexico, General Stephen W. Kearny led 1,700 soldiers into Santa Fe to claim it and the whole New Mexico Territory for the United States. By 1848 the U.S. had officially gained New Mexico by terms of the Treaty of Guadalupe Hidalgo. 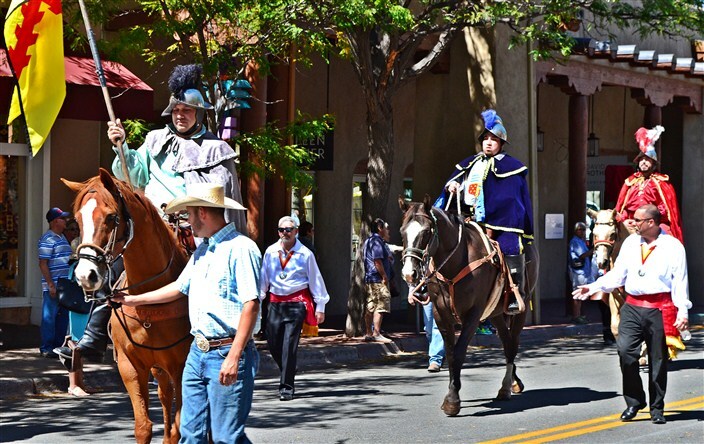 Santa Fe then became the capital of New Mexico territory prior to it’s statehood in 1912. Before the Spanish marched in, the area was inhabited for centuries by the Pueblo Indians. Maybe inhabited isn’t the right word. Eked out enough to survive is probably a more accurate way to describe the lives they led in this dry, barren and inhospitable land. They subsisted on a diet consisting of corn, beans, and squash. Not the most varied or nutritious fare, one major contributing factor to their short life expectancy. Then the Spanish arrived and, for better or worse (I’m not getting into that argument here) changed everything. All this history wouldn’t mean much to me if it hadn’t intersected in a serendipitous manner with our visit. 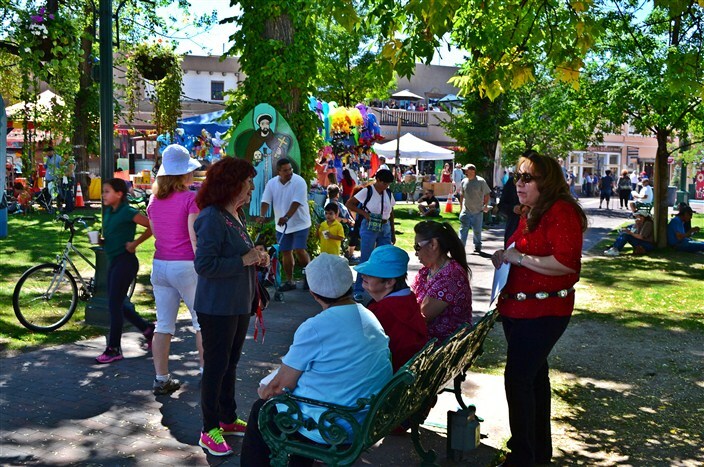 Randomly, with no planning or foreknowledge on my part, we arrived in town during the biggest local party week of the entire year, the Santa Fe Fiesta. 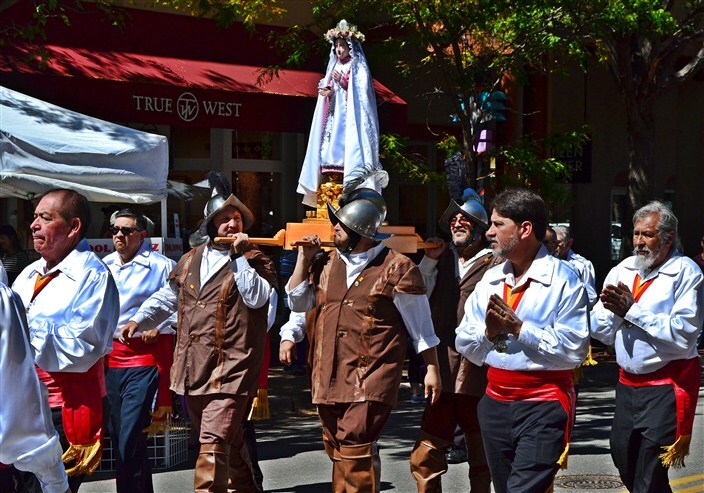 Held annually the weekend after Labor Day, this festival sees the already bustling tourism scene in Santa Fe reach one of its yearly high points. Good luck finding a hotel room. Well, we actually did without too much trouble, but it was nowhere near the town center. 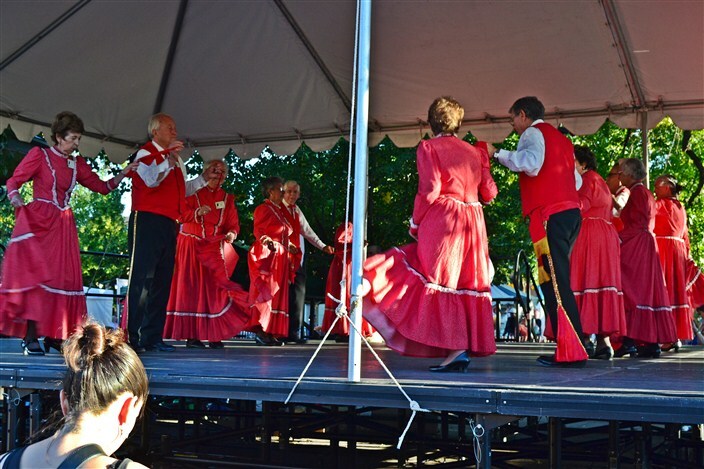 The Fiesta includes lots of live music and food booths set up in the town’s central plaza and hordes of people to go with it. I’m not normally a fan of big crowds, but we were already there and decided to roll with it. As things turned out, it was a lot of fun. Mostly. Where the historical aspect came into play was on Friday. As we were roaming the plaza and taking in the festival’s sights and sounds we noticed a cadre of police motorcycles approaching, followed by a group of men, some mounted on horseback, some on foot. The curious part was the men were all in colonial era costumes. The mounted men wore conquistador style uniforms, while the men on foot wore a variety of either priestly garb, that of foot soldiers, or Native Americans. Turns out this is an annual part of the Fiesta, a re-creation of the Spanish conquest of the city or the territory or whatever. Only as this group proceeded slowly toward the main stage did I notice a secondary group of folks not too far from the stage who wore an angry, self-righteous, somewhat shabby look that I immediately recognized: protesters. They were prevented from coming too close to the stage by a sizable police presence which did nothing to deter them from waving their many signs and shouting their insults and chanting their slogans. As far as we could tell, their beef was that the festival shouldn’t include this marching into the city “glorification of colonialism” (their words, not mine.) Apparently this debate has been an ongoing part of the festivities for several years now. 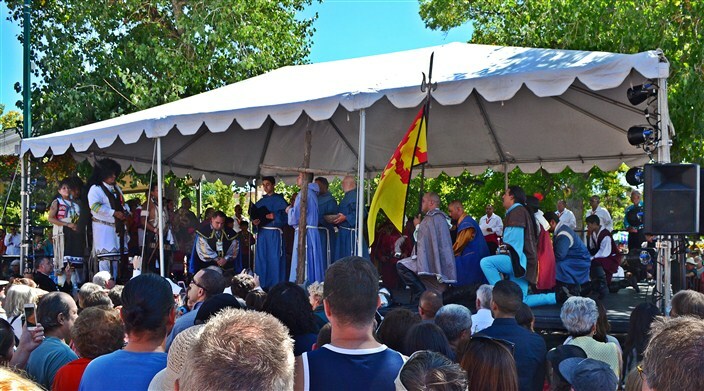 The conquistadors and priests and Indians got up on stage and did their ceremonial play acting while the protesters continued to try and shout them down. The neutral onlookers, like us, seemed not to care much one way or the other. At one point the protesters tried surging forward and only then did I notice on the roof of the building behind us the three heavily armed commando/swat style cops watching everything. I suddenly realized that we were almost directly between the protesters and the stage and if anything violent were to happen, this maybe wouldn’t be the best place to be standing. We retreated to a more withdrawn vantage point to watch the rest of the proceedings play out. In the end nothing much happened. 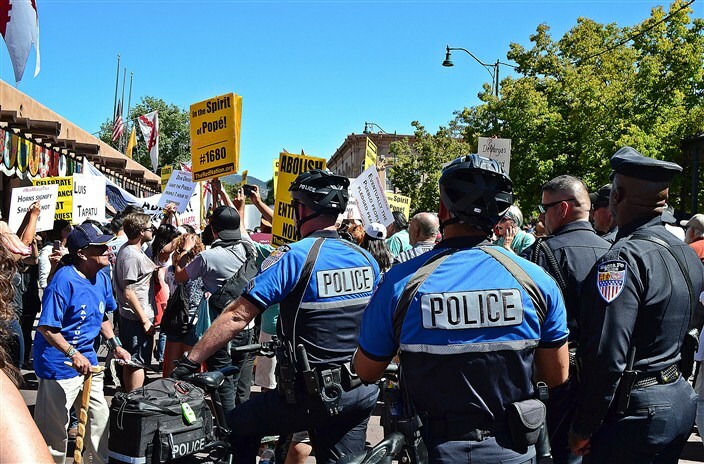 The actors finished their show to a mixture of cheers and jeers, the protesters marched once around the plaza chanting while being ignored by everyone, then slowly disbanded. Another musical act came on stage and pretty soon everyone resumed dancing and eating and having a good time as though the whole thing never happened. 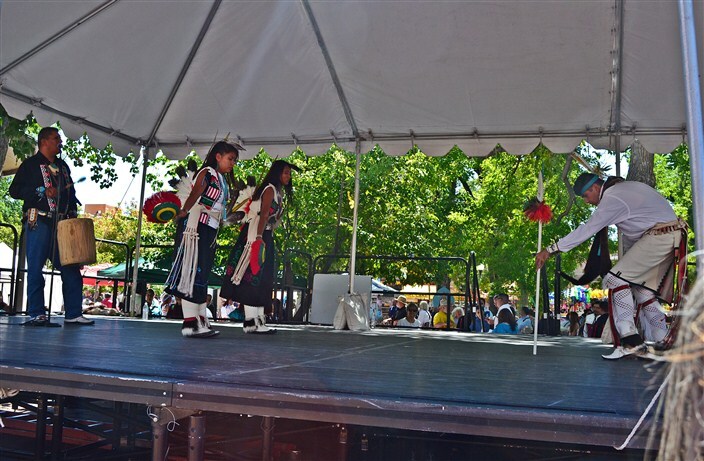 Santa Fe is well known as a center for arts that reflect the multicultural character of the city; visual arts, sculpture, music, dance, opera, literature, museums, you name it, they’ve got it, a fact all the more remarkable when you realize this is not a big city. 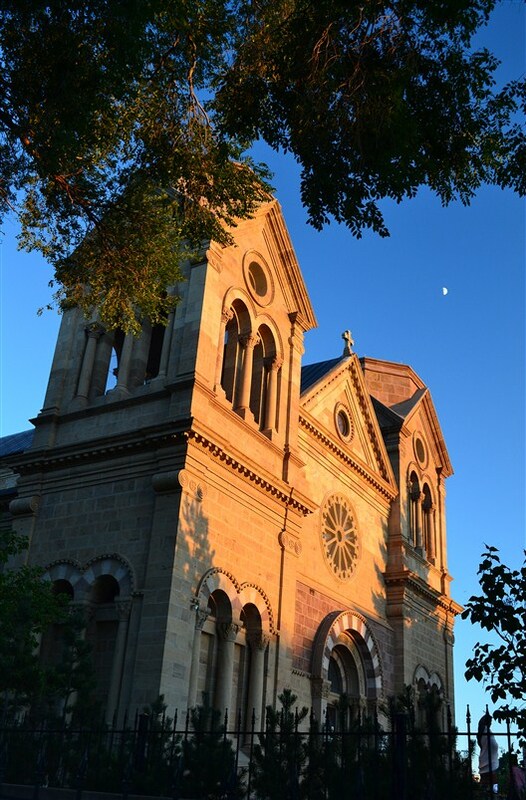 Santa Fe is the fourth largest city in New Mexico, with a population of around 70,000 people. That the state’s fourth most populous city has under 100,000 people speaks volumes about the rural, empty nature of most of the state. The other telling statistic in this regard is that despite being the fifth largest state in area, New Mexico is the thirteenth lowest in population. That’s a whole lot of wide open spaces, a fact which becomes abundantly clear when you start driving from one part of New Mexico to another. But back to Santa Fe and the arts. 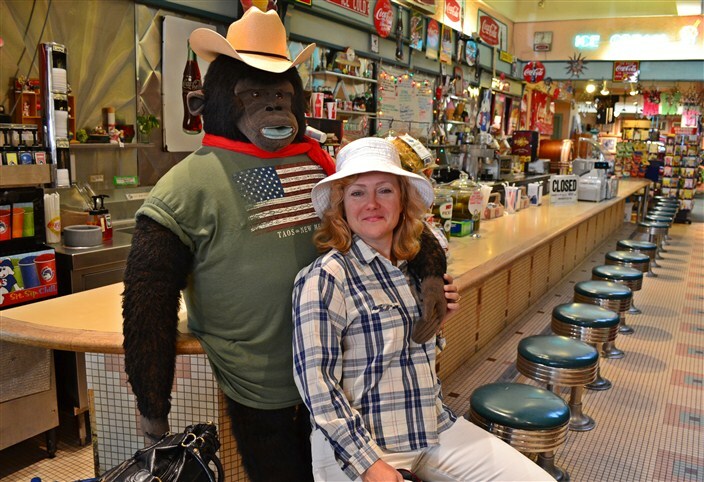 If it’s galleries you’re after, Santa Fe is heaven on earth. They have more galleries per square foot than Seattle has Starbucks. We perused a few of them, but if you ain’t rich, you ain’t buying. Not in Santa Fe. Okay, I’m a thrifty guy and proud of it, so I’m not their target audience for this stuff anyway, but holy cow, the prices we saw would give any sane person a heart attack. Maybe that’s why we saw so many benches scattered on the sidewalks and throughout the plaza, so people could sit down as they clutch their chest and try to recover their breath after looking at too many overpriced items. 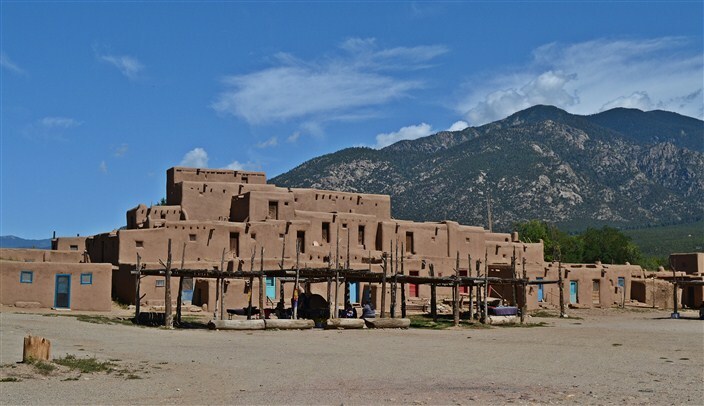 A great day trip from Santa Fe is the nearby town of Taos, about a 70 mile drive through the scenic Sangre de Cristo mountains. Some might say Taos deserves a couple of days to itself on your New Mexico itinerary, but we found one to be sufficient. 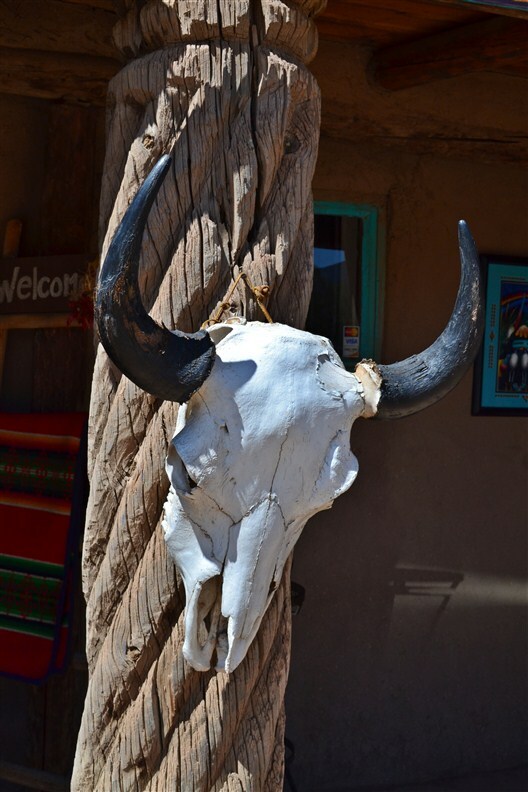 As in Santa Fe, Taos is another artsy enclave, bursting with overpriced galleries of every kind, just on a smaller scale. Again, if this is your thing, you’ll love it. For us, a little went a long way. 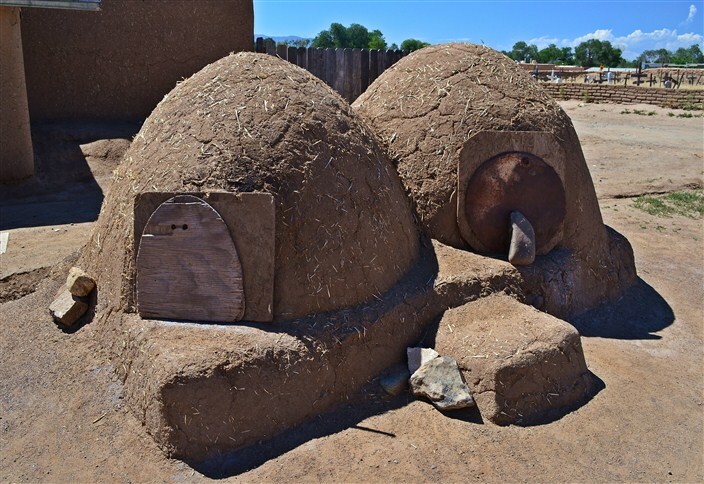 The most interesting thing we found to do in Taos was visiting the Taos Pueblo, considered to be the oldest continuously inhabited Indian community in the country, having been occupied for nearly a millennium. It is estimated that the pueblo was built between 1000 and 1450 A.D., with some later expansion. 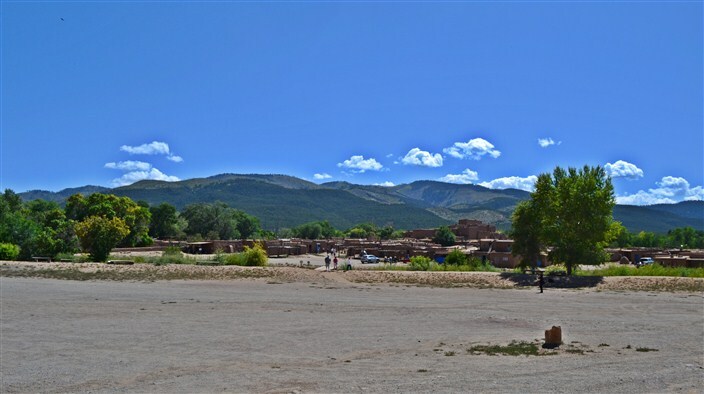 Located in a tributary valley off the Rio Grande, it is the most northern of New Mexico’s pueblos. 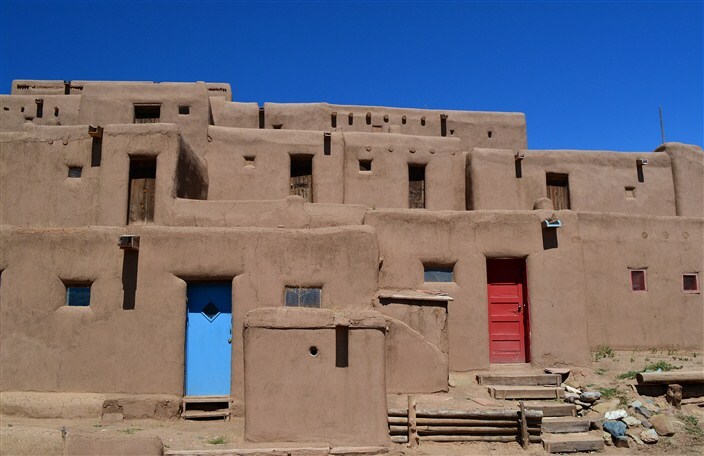 In some places the pueblo is five stories high and is a combination of many individual homes with common walls. There are between twenty to one hundred people who live at the pueblo year-around, with this figure varying from season to season. One reason for this variance is that the Pueblo features no electricity or running water. Cold, snowy winters without indoor heating would certainly make me think twice about spending the winter there. 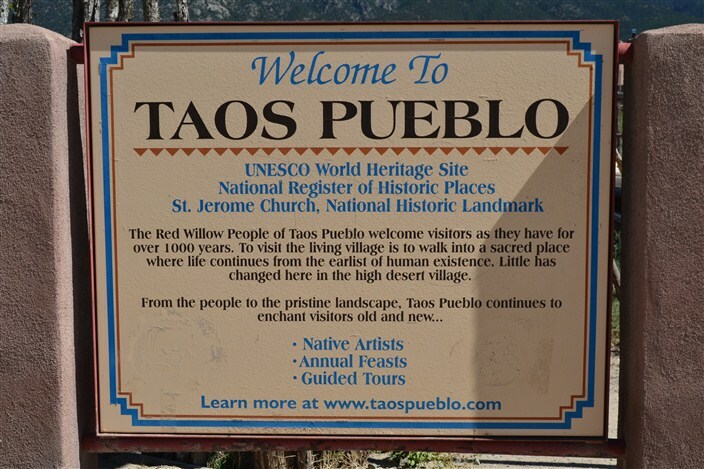 The Taos Pueblo was added as an UNESCO World Heritage Site in 1992. 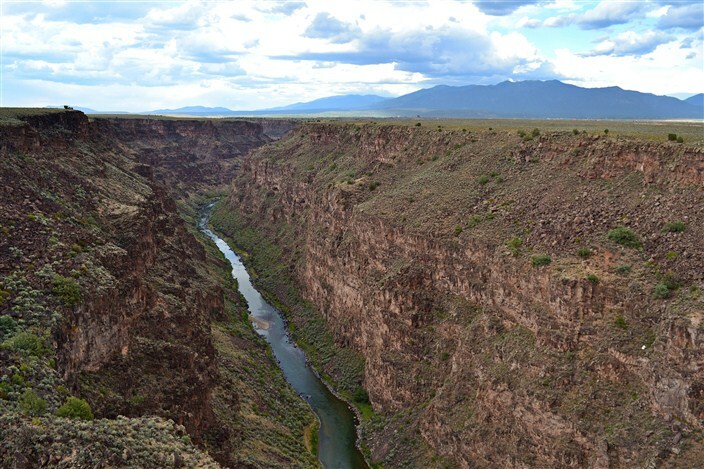 Just to the west of Taos along U.S. 64 is the Rio Grande Gorge, cutting through the basalt flows of the Taos Plateau volcanic field and crossed by the Rio Grande Gorge Bridge. It’s well worth a short detour out of town to cross the bridge spanning this 800 foot deep gorge and take a few photos. Just north of Taos is Wheeler Peak, at 13,161 feet (4,011 m), the highest point in New Mexico, and yes, the area is a skiing mecca in the winter. There’s a loop drive of about 70 miles called the Grand Circle involving three different highways which circles from Taos around and through this mountainous area. We chose to drive it heading east, then north and back into Taos heading south, but you could do it in either direction and the scenery is the same. As someone who’s lived most of my life in Washington, where stunning mountain drives are a way of life, I don’t know if I’d call this one “grand” or not. It’s nice enough, but maybe the Pretty Okay Circle would be a better name for it. If you’re headed to New Mexico, be sure you don’t miss out on this northern part of the state, which is well worth a few days of your time.